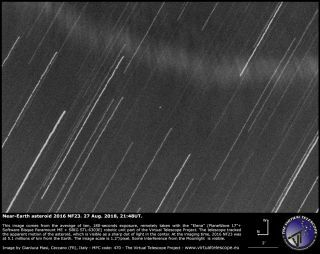 The near-Earth asteroid 2016 NF23, as seen on Aug. 27, 2018, by a robotic unit of the Virtual Telescope Project in central Italy. A decent-size asteroid that's about to zoom past Earth looks like a tiny, unimposing dot in a newly captured image. That's appropriate, because the space rock, known as 2016 NF23, poses zero risk to our planet during tonight's (Aug. 28) close encounter, despite what some breathless media reports may have led you to believe. Indeed, 2016 NF23 will still be more than 3 million miles (4.8 million kilometers) from Earth during its closest approach, which occurs tonight at 11:38 p.m. ET (0338 GMT on Aug. 29). Scientists think 2016 NF23, which completes one lap around the sun every 240 Earth days, is between 229 feet and 524 feet (70 and 160 meters) wide. The media storm about tonight's flyby apparently stems from 2016 NF23's status as a "potentially hazardous asteroid." But this designation doesn't suggest impending doom; it applies to all asteroids that get within 4.65 million miles (7.48 million km) of Earth's orbit at some point and seem to be big enough to cause serious damage on at least a regional scale if they hit us. The new photo was taken last night (Aug. 27) by the Virtual Telescope Project's 17-inch (43 centimeters) scope from the city of Ceccano, in central Italy. At the time, 2016 NF23 was about 3.2 million miles (5.1 million km) from Earth, according to Virtual Telescope Project founder and scientific director Gianluca Masi. "The telescope tracked the apparent motion of the asteroid; this is why stars show as small trails, while the asteroid looks like a sharp dot of light in the center of the image," Masi wrote in a description of the photo. "On the top of the image, there is [a] bright band, due to the interference of a very strong full moon, which was less than 40 degrees away. The asteroid was also very low on the horizon, only 24 degrees above it."